When White Rose opened a new location on the main street in Dallastown, a borough of York County with just 4,000 residents, it wanted a sign that would allow it to actively show its support for the community, as well as display marketing messages to help the branch grow. Jen Swanner, marketing vice president for the credit union, turned to W.J. Strickler Signs, a company that has served the mid-Atlantic region since 1972. 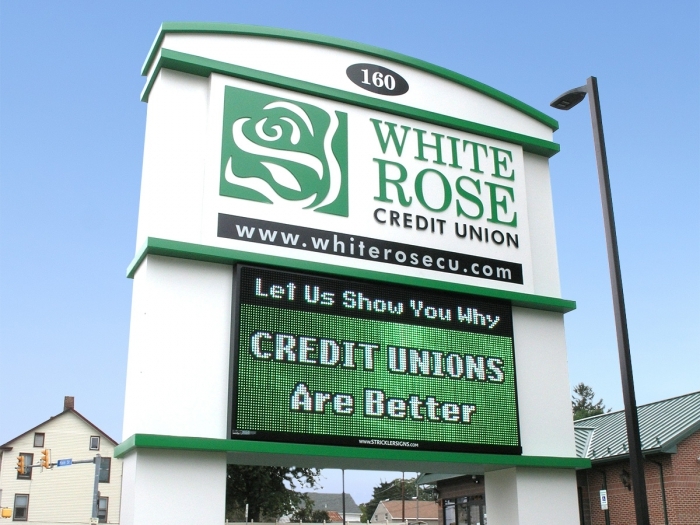 The company designed an 18΄ tall pylon sign with the White Rose Credit Union logo and name illuminated on top, and specified a full-color LED display from Watchfire Signs. “This branch was a new build for us, and since we were investing in a new property, we felt it was the right time to invest in a long-term marketing platform as well,” said Swanner. White Rose’s very visible support of the community via their LED sign not only supports the organization’s mission, but also has been good for business. Swanner says that she rotates about eight messages at a time, and she changes out marketing messages every month. In between, she is able to upload individual community messages in under five minutes.